by Dr. Christopher Chang, last modified on 2/21/19. There are many possible causes of pain in or around the ear although most patients and even physicians can think of only a few causes. Those causes being allergies, earwax or ear infection, whether it be a middle ear infection (otitis media) or Swimmer's ear (otitis externa). 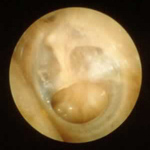 A few may even think of eustachian tube dysfunction as a possible cause of ear pain. As such, patients are often put on repeated doses of antibiotics, anti-histamines, nasal decongestants, and nasal sprays. In a certain percentage of patients, these medications do NOTHING to help with their ear pain/discomfort. Even tube placement in the ears fail to help. Out of desperation, some patients resort to unproven homeopathic medications listed here. Why does treatment targeting the ear not help? What most people do not realize is that otalgia (medical term for ear pain) may be due to problems totally remote from the ear itself. Indeed, many new parents realize that at least in children, new teeth coming out causes a child to dig or tug on his/her ears, though the ears themselves are completely normal. Indeed, this particular cause of otalgia is due to Cranial Nerve 5 that transmits pain involving the jaw to the ear itself. Sometimes the pain/discomfort is due to a non-biologic trigger, like cell phone use (read more about this here). There are many other examples of non-ear causes of otalgia. How is it possible that a problem elsewhere in the head and neck causes ear pain??? The main reason is due to referred pain secondary to the numerous nerves that go to the ear from problems found elsewhere in the head and neck. Listed below are the nerves and the most common reasons that produce a particular type of ear pain/discomfort. As one may realize from reading the descriptions, the precise area where the ear pain is felt can lead one to focus on a particular region of the head and neck. 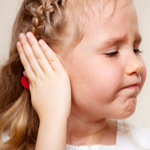 At least 40% of patients presenting to our ENT office with the chief complaint of ear pain is found NOT to have ear infections, but rather some other non-ear issue causing their otalgia. In a primay care office, that number is probably lower. SO, how does one go about figuring out a patient's ear pain if he/she does not appear to have an ear infection on exam? Really, one needs to perform a comprehensive head and neck exam, including examination of the nasal cavity, oral cavity, neck, cervical spine and TMJ. Finger palpation of the tonsil and base of tongue region is a quick and dirty way to figure out hidden oral cavity and throat causes of ear pain. 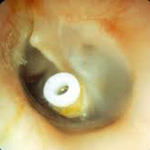 Your ENT may perform fiberoptic endoscopy to more closely examine the nose and throat hidden from direct view. Radiologic exams such as CT or MRI may even be ordered as well. How long does the pain last (all the time, a couple hours, a couple seconds, etc)? What does the pain feel like exactly (sharp, pressure, itchy, burning, etc)? Exactly where in/around the ear does the pain occur (deep in ear, behind ear, below ear, etc)? 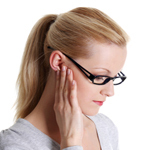 If a thorough workup by your primary care as well as general ENT has been obtained and still no cause for ear pain has been found, an evaluation by an experienced rheumatologist, neurologist, and neuro-otologist may be the next steps to take. Not uncommonly, the ear pain may end up being due to a condition called trigeminal migraine, an atypical migraine headache centered over the ear region. Recognized experts in the mystery ear pain are neuro-otologic surgeons. Click here to see a list.